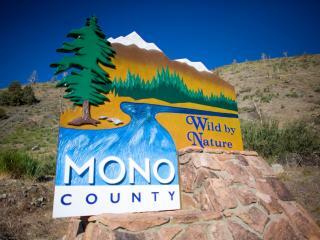 Several significant wildlife viewing sites are located in Mono County, as designated by California Watchable Wildlife. They are identified by brown and white roadside "binocular" Wildlife Viewing Area signs. Eight native fish species including Lahontan Cutthroat Trout, Canada geese, beaver, mink, river otter, eagles, falcons, migratory birds, mule deer, occasional black bear and mountain lions. Subalpine springs and meadows offer views of nutcrackers, rock wrens, an occasional bobcat, red-tailed hawks, and marmots. Tioga Lake attracts Caspian terns, gulls, spotted sandpipers, and other shorebirds. A trillion brine shrimp and millions of alkali flies feed 70 species of migratory birds including 1 million eared grebes, 50,000 California gulls, and thousands of killdeer, Wilson's and red-necked phalaropes. 1.75 million golden, Kamloop, cutthroat and rainbow trout are bred here, plus 12 million fish eggs are produced for other hatcheries. See mallard ducks, cinnamon teal and bald eagles nearby. Ponds and a wetland that attract mallards, cinnamon teal and ring-necked ducks, Canada geese, American avocets, killdeer. Look for sora (common rails) hiding in marsh vegetation, overhead for prairie falcons, golden eagles and rough-legged hawks, and in open sage flats for sage thrashers, sage sparrows and sage grouse. Mule deer, often 300 at a time, can be seen migrating through the area in May, September and October.